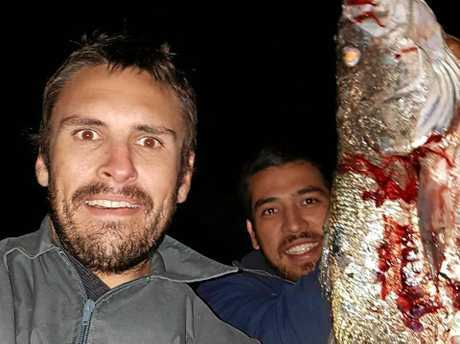 TWO mates, going for a quiet evening fish on the Tweed River, have scored themselves the catch of a lifetime with a massive 13.5kg mulloway caught off the rock wall. 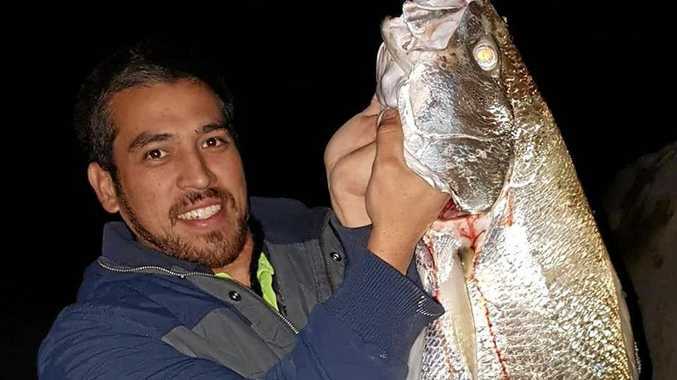 Tweed locals Mark Coleman and Finlay Walters knew they were onto a fishing odyssey of Hemingway-esque appeal on Tuesday night when they felt the first tug of the mammoth 1010mm fish biting onto their line. Mark Coleman, a fisherman in fine form, says fishing is the best it has been in the Tweed River for years. It took a toil of 30 minutes and every bit the strength of two men to land the 13.5kg fish on the rock wall. 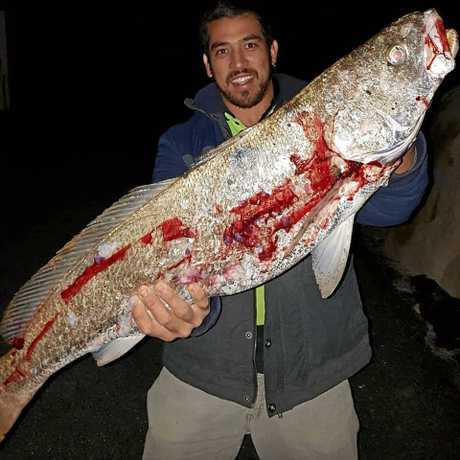 "This is one of the best catches in my life out of the river," Mr Coleman said. But the keen angler refused to take all the credit for his big haul. "There was no way I could've done it without my good mate Finlay Walters and it's great to have pulled this one in with him," he said. Mark Coleman and Finlay Walters caught the 1010mm Mulloway at the Tweed River entrance on the Duranbah Beach side. The catch is a symbol of a bountiful fishing season that Coleman said has started early in the Tweed. "The word is that these types of fish as well as plenty of others are starting to be caught in the Tweed River, when generally the river doesn't come alive for another month," Coleman said. "It's good news for us... Personally I think it's the most alive the river has been for over five years at least." Lending some professional credence to Mr Coleman's optimism, Sam Adra from Tweed Tackle and Marine said fishing in the area was starting to settle in after some turbulent weather. 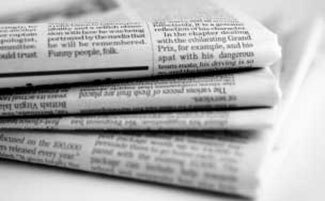 "The last 10 days everything has calmed down and especially the last week the fishing has been really good," Mr Adra said. "Some good quantities of snapper, pearl perch, parrot fish and still a lot of mac tuna are around. The Tweed River has been firing too. Plenty of flathead, brim, mulloway and winter whiting. We're hoping in the next four to six weeks the black fish and brim will start moving with the mullet." An Aboriginal name meaning 'The Greatest One', mulloway were so popular in the 1980s for use in fish and chips their stocks suffered a drastic decline, making this catch even the more appealing. If you're after a handsome catch like Coleman and Walters, Mr Adra said the north wall was a great place to start. "The north wall is reasonably safe and you just have to work the tides," he said. "There's no reason why you wouldn't be able to get a good feed and something to take home." The emergent conditions come just in time for next month's Tweed Coast Marine Greenback Fishing Competition on June 9 and 10, a popular drawcard for anglers from both sides of the border. For more information on the competition go to www.lionsgreenback.com.